Stox’s founder Moshe Hogeg, the Israeli entrepreneur, has denied allegations of misappropriating investors’ funds in a lawsuit filed against him and his company. Earlier in January, a Chinese investor by the name of Zhewen Hu filed a lawsuit against Stox and Hogeg for damages worth $4.6 million. Hu claimed that he had invested about $3.8 million in ETH (Ether) in an open source platform based on Ethereum. According to the filing, Hu has expected that Stox’s prediction market platform would be successful and would therefore increase the value of the company’s native token STX. The launch of BitTorrent’s new token, BTT, was one of the main headliners last week. The ICO of the token was completed in less than 15 minutes. Now people want to know about this new token. The main thing is that this airdrop was just the first of many. Of the 990 billion BTT tokens that have been created on the Tron Blockchain, 10.1% have been kept aside for airdrops that will take place over a period of 6 years, starting Monday. The airdrops have been scheduled to take place every month, and will get larger once every February. Heister Peirce, a commissioner of the US SEC (Securities and Exchange Commission) and also known as Crypto Mom for her criticism of her agency for rejecting a BTC ETF (Bitcoin exchange traded fund), stated that the delay in establishing crypto regulations could be a good thing. She gave further explain about her statement. She said that the SEC may able to create stronger delineations once more crypto related projects matured. She said that by delaying drawing out rules at this time would mean that the nascent technology would have more time to develop on its own without interference. 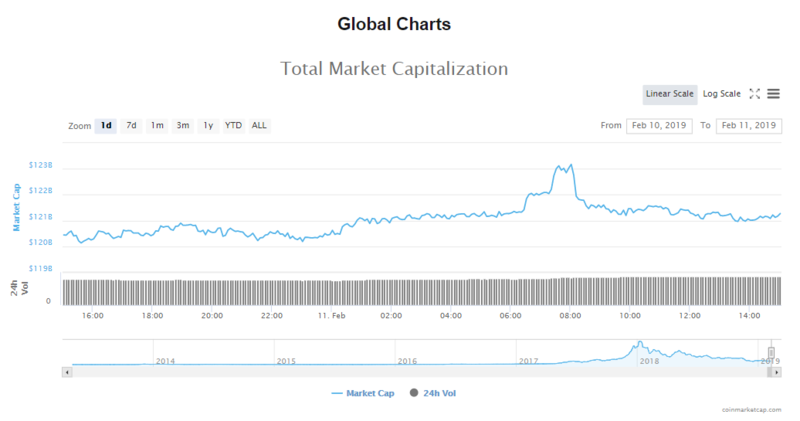 After big gains over the weekend, the surge is now subsiding and the cryptocurrency market’s capitalization is now $121.29 billion. Trading volumes are at $20.72 billion. Bitcoin’s price has slipped minutely by 0.04% in the last 24 hours to $3656.87. Capitalization of the crypto is now at $64.11 billion and trade volumes are at $6.33 billion. 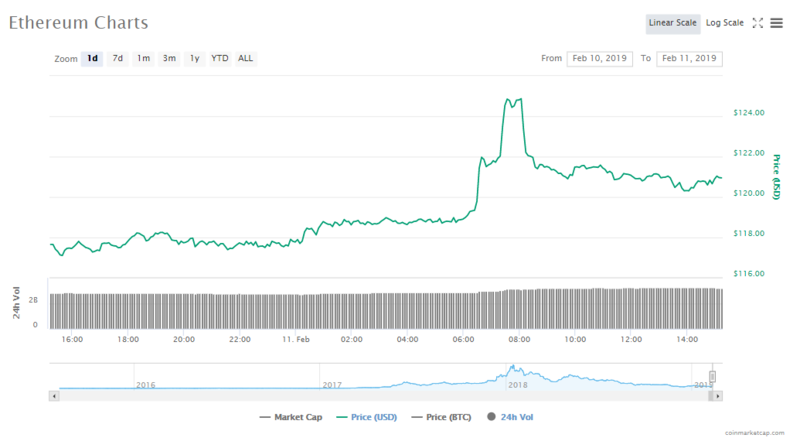 Ether’s price is up by 2.46% in the last one day to trade at $120.99. The market capitalization of the token is now $12.68 billion and it is experiencing trade volumes of $3.18 billion. Ethereum is once more in second place in the top ten list of the world’s most valuable cryptocurrencies. Since Saturday’s surge, the market slipping once against on Sunday. Today, in trading so far, most cryptos are showing very slight gains or losses, with the exception of Binance Coin, which has gained 4.17% since yesterday. The next biggest gains are by Litecoin, up by 3.16% and Ether, up by 2.46%. Bitcoin’s token price is $3656.87, dipping 0.04%. Bitcoin’s worth in the market is now $64.11 billion. Ethereum’s token price is $120.99, gaining by 2.46%. Ethereum’s worth in the market is now $12.68 billion. Ripple’s token price is $0.304515, dipping 0.10%. Ripple worth in the market is now $12.53 billion. Litecoin’s token price is $44.74, gaining 3.16%. Litecoin’s worth in the market is now $2.70 billion. EOS’s token price is $2.76, gaining 1.98%. EOS’ worth in the market is now $2.49 billion. Bitcoin Cash’s token price is $124.53, dipping 1.31%. Bitcoin Cash’s worth in the market is now $2.19 billion. 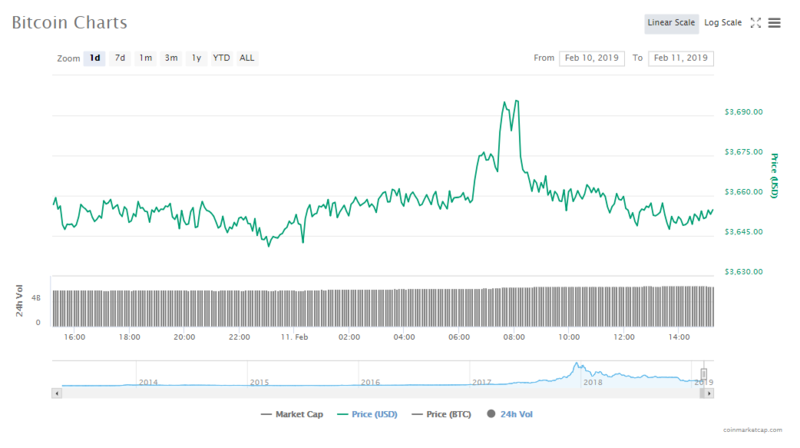 Tether’s token price is $1.01, gaining 0.17%. Tether’s worth in the market is now $2.03 billion. TRON’s token price is $0.025676, gaining 0.32%. Tron’s worth in the market is now $1.71 billion. Stellar’s token price is $0.079107, gaining 0.40%. Stellar’s worth in the market is now $1.51 billion. Binance Coin’s token price is $9.50, gaining 4.17%. Binance Coin’s worth in the market is now $1.34 billion. Russia’s largest bank, Sberbank CIB and the National Settlement Depository (NRD) will be piloting the country’s first ever official Initial Coin Offering (ICO). This pilot will be conducted in the Bank of Russia’s regulatory sandbox. Social media giant, Facebook Inc., is launching its in-house blockchain research unit that will be headed by David Marcus. Marcus previously served as the company’s vice president for Facebook’s Messenger business division, prior to which he was a vice president with PayPal. Hyperledger’s Technical Steering Committee has given its approval for the Ursa project, which is a modular cryptographic library. According to the announcement made by Hyperledger, as they have continued to grow and mature, they have found that projects have developed a need for sophisticated cryptographic implementations. According to the Global Head of Product and Propositions for Global Trade and Receivables Finance at HSBC, Vinay Mendonca, distributed ledger technology (DLT) is going to change the way global trade works. However, how it changes the world of trade will depend on how regulations are put in place.